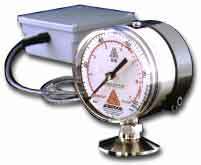 The Anderson Life Sciences Series IPS 200 Indicating Pressure Switch is a gauge with two independent switches. This gauge offers user adjustable high and low setpoints and provides a separate solid state, ground closure switch for each. The solid state circuit requires an external 12-24 VDC supply, and each switch is capable of handling 1 amp maximum at 24 VDC. Switches will automatically reset themselves once the process variable clears the setpoint. An optional 115 or 230 VAC interface module will provide a SPDT (Form “C”) electromechanical relay for each setpoint which will switch up to 6 amps.